Our instinctive need to design for adaptation in (unpredictable) climates, made it possible for us to survive (unlike the Neanderthals) and shape the modern way in which many of us live today. Yet, there are still so many solutions that can be implemented into our architecture to help us continue our journey. 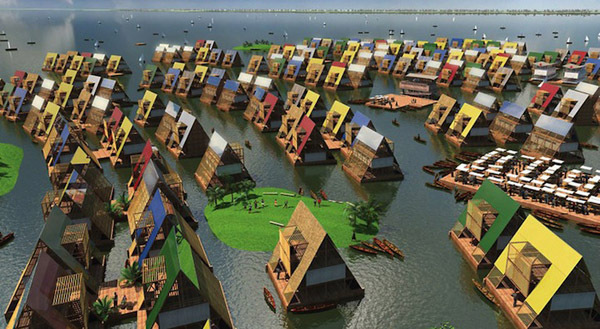 For instance, the coastal community of Makoko, a slum neighborhood in the Lagos lagoon of Nigeria, is receiving an upgrade to its current solution, which is building homes supported on stilts within the lagoon’s waters. 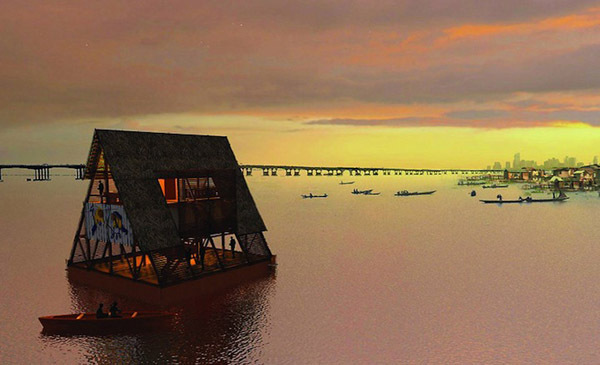 NLE architects, with sponsoring from the United Nations development programme, designed the Makoko floating school phase one of a three-phase development, that will become a floating community of floating residences. 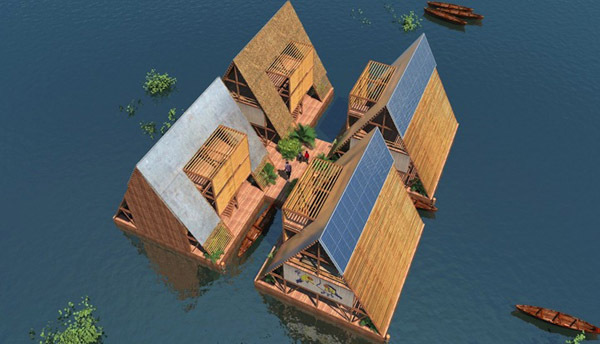 The Makoko floating school makes use of local materials and resources, wood is used as the main material for the structure, support and finishing. The overall composition is a triangular a-frame section with classrooms located on the second tier. The classrooms are surrounded by public green space, there is a playground below and the roof contains an additional open air classroom. NLE has also implemented strategies to make the floating architecture sustainable by applying PV cells to the roof and incorporating a rainwater catchment system. The structure is also naturally ventilated. The completed structure rests on a base of typical plastic barrels. This simple solution reflects a reuse of available materials. The second phase of the project will include the construction of individual homes that follow the same aesthetic as the school. These elements will be able to connect to each other or may float independently. Phase three will allow for the development of a large community of floating architecture. This project might be an inspiration for similar ideas and systems to address climate change..